CHICAGO, Ill. /eNewsChannels/ — Golf enthusiasts will smile at this: Golf Pipeline is a place where you can now track every aspect of your golf game in one convenient and comprehensive web portal. Golf Pipeline provides a place to search and book tee times, invite your friends to join in the game, track your scores as you go, and much more. Booking tee times is just the start of everything that Golf Pipeline has to offer. Members of Golf Pipeline have access to join a club that is licensed to use the USGA Handicap System(TM), allowing you to see your game progress as you play! Tracking begins automatically after 5 game scores have been added to your account, and will make it easy to see your game improve. Golf Pipeline allows you to see where your scores measure up to your competitors, and comment on your friend’s scores as they do the same! Network and communicate with other golfers, and never feel disconnected from the game! Post your golf scores and other updates to Facebook, Twitter or LinkedIn from your golf profile. Booking a tee time has never been easier. Golf Pipeline lists out all open tee times in your area and will let you book directly online with no booking fees. 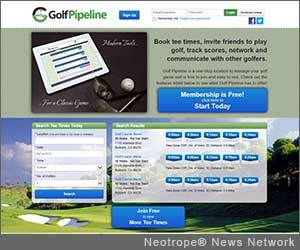 The hassle of contacting all of your golf friends individually is removed when you use Golf Pipeline. The website allows you to create group invites and automatically tracks as players RSVP. Invite friends using email addresses, Facebook friends, or LinkedIn contacts. Stop all the texting, emailing and calling to fill your tee time, and just invite your golf friends. The first invitees to accept are in with no hassles! Membership is free, quick, and easy to get started. Simply visit http://www.golfpipeline.com/ and start tracking your game online today. Golf Pipeline – Spend less time planning and more time playing – The new way to manage your game. From Golf Pipeline Corporation. News Summary: Golf enthusiasts will smile at this: Golf Pipeline is a place where you can now track every aspect of your golf game in one convenient and comprehensive web portal. Golf Pipeline provides a place to search and book tee times, invite your friends to join in the game, track your scores as you go, and much more.